A story written by John W Campbell , published in 1938, perhaps loosely inspired by HP Lovecraft's At The Mountains of Madness in which a group of scientific researchers, isolated in Antarctica by the nearly-ended winter, discover an alien spaceship buried in the ice, where it crashed twenty million years before. They try to thaw the inside of the spacecraft with a thermite charge, but end up accidentally destroying it when the ship's magnesium hull is ignited by the charge. This story would later be filmed as "The Thing From Another World"
Hergé released this comic book story in 1944. 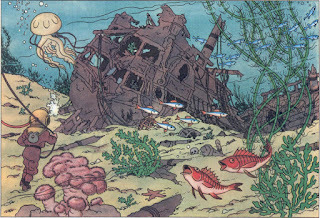 In a treasure hunt, an island is discovered where an idol of Sir Francis Haddock, ancestor of Captain Haddock, would be discovered and brought back to the ship, the Sirius. Then a ship, the Unicorn is discovered as a wreck at the bottom of the ocean. Amongst other things, a box with fragments of a document are discovered, and the document when partially reassembled by Professor Calculus makes a mentions Captain Haddock's family estate, where in the cellar, a globe is discovered, the top pops off and treasure can be found inside. 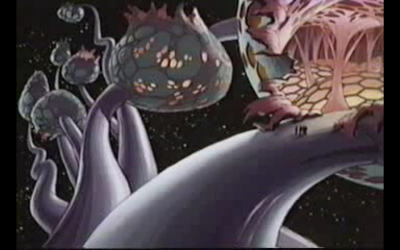 So it's as if the structure of this story got into Dan's script, with the idol of Sir Francis Haddock being retrieved as the space jockey's head was, and then the shipwreck of the Unicorn beneath the sea becomes the derelict ship, the box with the fragmented documents becomes the triangle that the alien pilot scratches into the dashboard. Then Captain Haddock's family's estate becomes the pyramid with the cellar becoming the birth chamber and the globe with the treasure inside becoming one of the so called eggs. See also Traces of "The Adventures of Tintin: Red Rackham's Treasure" in Alien? 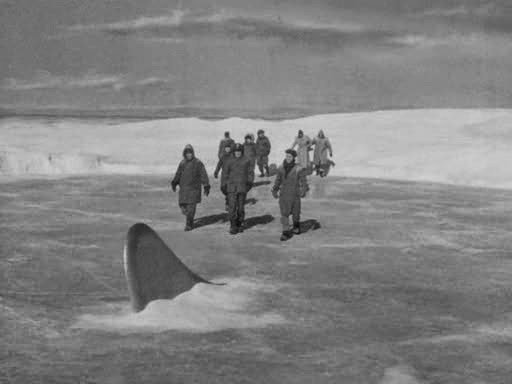 g) Howard Hawk's "The Thing from Another World"
Howard Hawks The Thing From Another World revealed the presence of a crashed flying saucer in a 1951 movie, encased in ice. published in Galaxy Science Fiction magazine, in May 1953, followed by the X Minus One presentation of the story as a radio play in 1956. In this story the ship has it's engines ripped out by another alien race who left their engine parts behind since the organism in the tower made them forget how to operate their own engines. 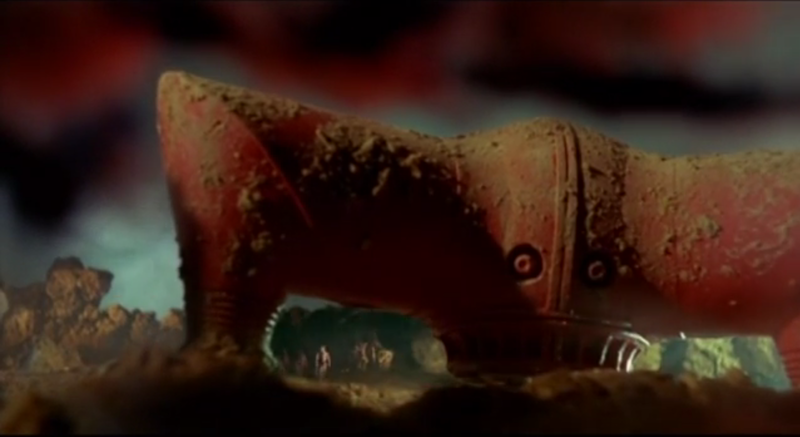 In 1956, the movie The Forbidden Planet was released, featuring a machine in the form of an underground 20 mile square complex left behind by a civilisation known as the Krell about 200,000 years ago, that had become a victim of their own technology that was designed to materialize anything that they could imagine projecting matter anywhere on the planet, and so the Krell became a victim of their own Id. 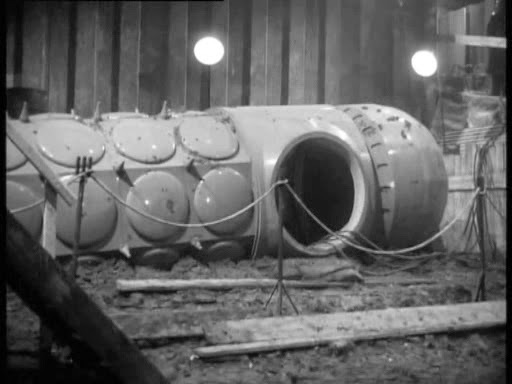 In 1958, the idea of an alien derelict ship with a mystery attached to it presented itself in the BBC TV series Quatermass And The Pit written by Nigel Kneale. 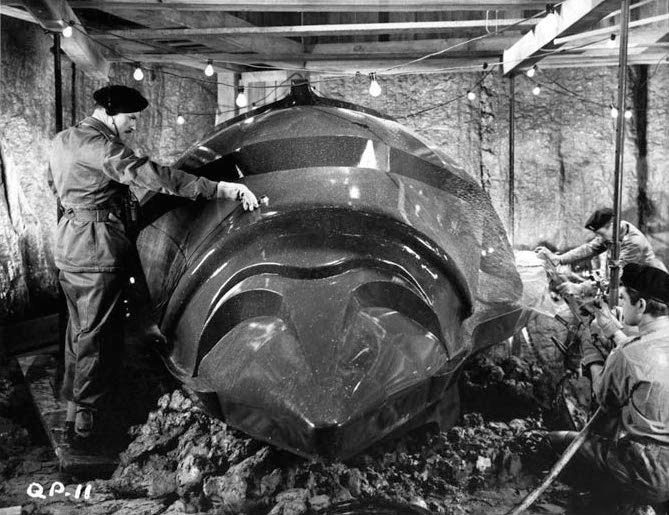 In the story a five million year old spacecraft containing the preserved remains of its alien pilots is discovered in a building site in Knightsbridge in London, and then in 1967, a film version was made where the ancient spacecraft is discovered in a London Underground train Station in Knightsbridge. Dan O'Bannon when he saw this movie was very impressed by the idea of finding a wrecked alien space craft, and investigating inside of it, and finding the remains of the creatures. Renato Pestriniero wrote a short story in 1960 called One Night in Twenty One Hours detailing humans encountering the remains of dead extra-terrestrials coming to life and the remains of their crashed ships on an asteroid. 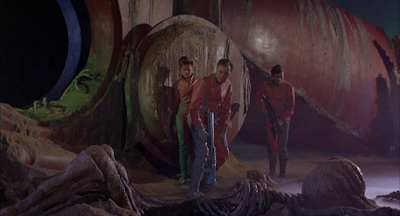 Later this story became the inspiration for Mario Bava's 1965 movie "Planet of the Vampires", which presented the image of a derelict ship with the skeleton of a human giant, the derelict looked to some degree like a giant beetle, the interior was a long ribbed circular tunnel leading into a vast central chamber which also served as a tomb like environment for it's skeleton of the deceased giant inhabitant. l) Space cemetery in "Valerian Vol 5 - Birds of the Master"
The two lead characters Valérian and Laureline crash upon an planetoid and encounter a space cemetery where most of the spaceships "declared lost in the galaxy" along with "others from different systems too". 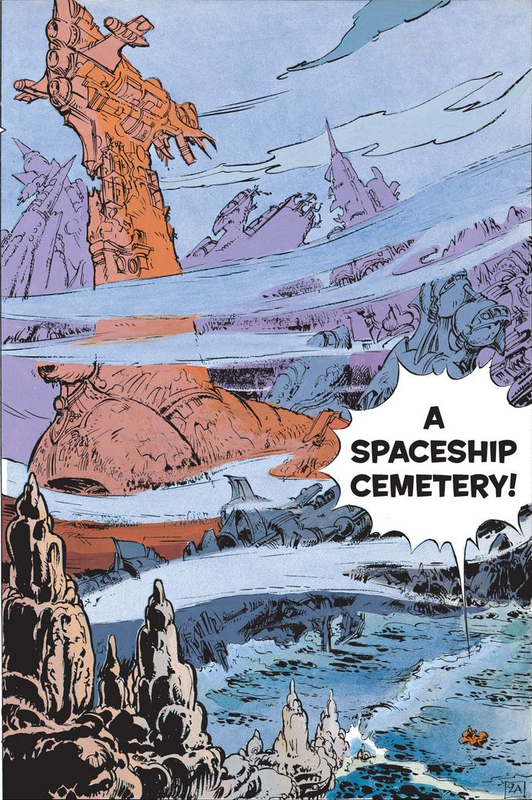 Although they wanted to take a closer look at the spaceship wrecks, the characters are in a boat on the water being taken away by the currents. 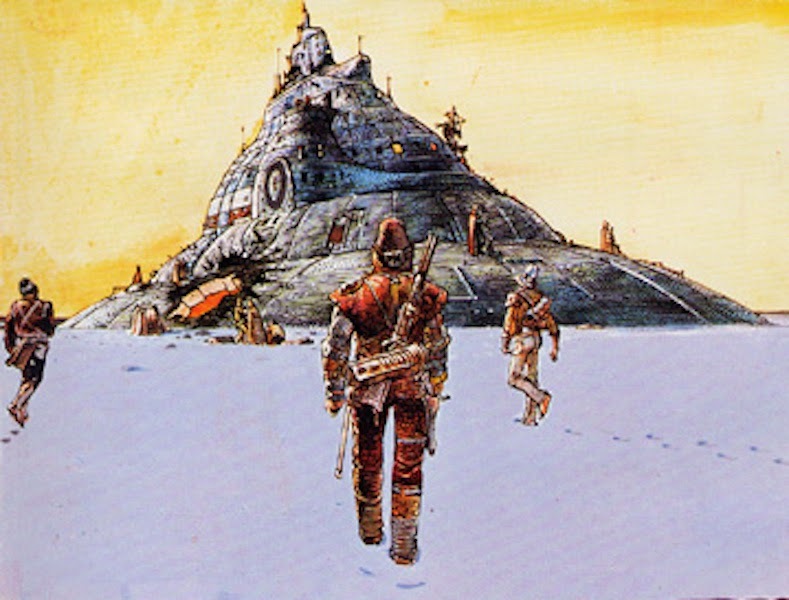 n) A derelict ship from Arzach by Moebius.